I guess most of you won’t remember today’s item of nostalgia. I have to admit i cant track down anything on it, so I’ll write what i can remember and rely on any input from you and your memories on these Jimmy Saville Cloth badges or patches. There were around six colourful cloth badges that could be collected if you sent several empty crisp packets to a provided address. At a guess it must of been around 1975. I think it was a Golden Wonder crisps promotion, but i cant be sure. 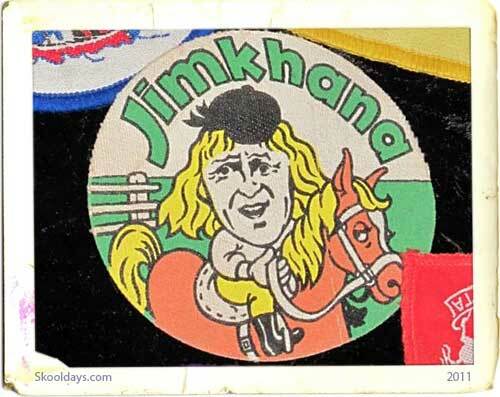 These 1970s sew-on patches was a play on words eg ‘Jimkhana’ (Jimmy Saville was a television presenter of a show called Jim’ll fix it). Jimmy Saville was also known for is adverts regarding the “Year of the Train” and Clunk Click every Trip for car safety. At the time Jimmy Saville was a top celebrity with his popular Jim ‘ll Fix It show. The show was all about kids with dreams and Jim fixing their dream into a reality. Went down a treat in the seventies. Also “Jim-Nasium” instead of gymnasium and so on. This entry was posted in Fashion, LunchBox and tagged 1970 by Skooldays. Bookmark the permalink. show you our Samples and quality. Tributes have been paid to “larger than life” veteran DJ and broadcaster Sir Jimmy Savile, who has died at 84. The star, who presented the first episode of Top Of The Pops as well as his long-running show Jim’ll Fix It, was found at his home in Roundhay, Leeds, on Saturday – just two days before his 85th birthday. Sir Jimmy Savile’s death came after a spell in hospital earlier this month with a suspected bout of pneumonia. Extraordinary – this page is a time warp! Well I bring you greetings from the future, where Whodunnit fan’s suspicions prove to have been well founded. Jimmy Savile was a ******* all along! I wonder what will happen when this news reaches the 1970s…. Going through my dads home at the weekend found the pedo/necro Jim cloth badges. Five of them. Dressed as a Scout, Horserider, Pirate, Vaulting and no, not in womens clothes, sliding on a banana skin. Bet he wanted the former.